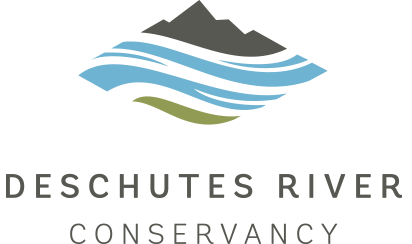 Even though the Willamette River Basin is extremely similar to the Deschutes River Basin in terms of size and geographic location, it has a much wetter climate. The differences in vegetation are pretty obvious even from satellite imagery! As the proud new owner of a whitewater kayak, I have been trying to figure out all of the best runs in Central Oregon to tick off as I learn my way around the boat. What I have quickly come to see is that there are only a handful of runnable rivers in the Deschutes River Basin, while there are dozens in the Willamette River Basin just on the other side of the Cascades. The Willamette River Basin is just a little bit bigger than the Deschutes River Basin (11,500 vs. 10,500 square miles), so why is the Willamette River nearly 6 times the size of the Deschutes River? 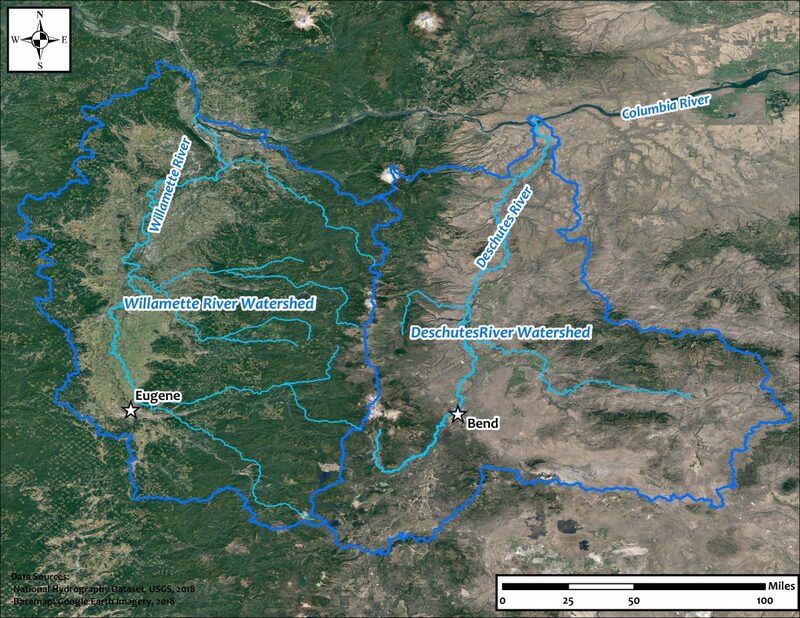 And why does the Willamette have so many sizeable tributaries compared to the Deschutes which only has a couple? It turns out that the Cascade Mountain Range itself has everything to do with the extreme difference in climate between the Deschutes River Basin and the Willamette Valley. Specifically, it is the rain shadow effect that is to blame. Understanding the rain shadow effect requires understanding a bit about what is known as the ‘water cycle’. When evaporation occurs from a large water body, water molecules travel up into the atmosphere where they coalesce into clouds. These clouds get blown around and ultimately dump all those water molecules back to earth as rain or snow. At this point, the cycle starts over. In the case of the Deschutes River Basin the nearest large body of water is the Pacific Ocean, and this is where the majority of cloud formation originates for the area. Clouds that form over the Pacific travel east where they eventually encounter the Cascade Mountain Range. At this point, they must rise as the earth surface rises, sending them higher into the atmosphere the further east they get. As clouds move up in the atmosphere, they cool down, which lowers their capacity to hold water, leading to rain and snow on the western slopes of the Cascades. By the time these clouds reach the east side of the Cascades, they have largely lost all of the moisture they were carrying, leaving little or none to dump on the Deschutes River Basin. We can see evidence of the rain shadow effect by looking at precipitation averages across Oregon. The City of Bend receives an average of around 11 inches of precipitation every year. Drive 130 miles east to the town of Burns, and this average stays roughly the same. Drive 100 miles west to Eugene, however, and the average annual precipitation more than quadruples to around 46 inches! The major difference is that mountain range in between Bend and Eugene. That mountain range also impacts the timing of streamflows in the Deschutes River, a topic we’ll explore next time. Born and raised in California, Jake moved to Bend in early 2017. As a hydrologist, he is excited to absorb all the local knowledge of the Deschutes River system!Jake has a BS in Geohydrology from UC Santa Barbara and a MESM in Water Resources from the Bren School of Environmental Science and Management. As a consultant, he strives to mitigate human impacts on the freshwater systems upon which we rely, and to restore natural function to highly-urbanized watersheds. Jake spends too much of his free time rock climbing, but also gets out boating and cycling whenever possible.